Here is a small, easily overlooked but quite beautiful little russula with a purplish rose cap, fragile stature, and surfaces that turn yellow as the mushroom matures. Not only does the entire stem turn yellow, but the cap surface eventually turns brown as a result of yellowing. 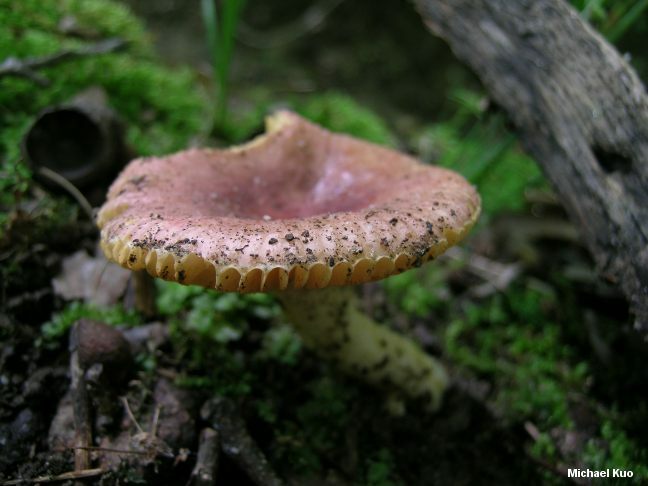 The taste of Russula puellaris is mild, and the spore print is yellow. 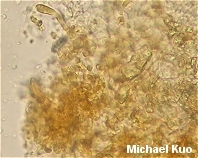 Microscopic features include clavate pileocystidia, and clumps of hyphal ends and pileocystidia in the pileipellis that turn golden yellow in ammonia or KOH. Russula puellaris is found in damp woodland areas and is apparently distributed--as a group of related species, at least--across our continent. Ecology: Mycorrhizal; found under hardwoods or conifers (especially spruces), often in moss; growing alone or scattered; summer and fall; apparently widely distributed in North America. Cap: 2-6 cm; convex when young, becoming broadly convex to flat, sometimes with a shallow depression and an arched margin; sticky when wet; fairly smooth; purple to rose purple with an almost blackish center at first, becoming pinkish to reddish and eventually brown as the underlying flesh yellows; the margin widely and strongly lined; the skin peeling easily, often more than halfway to the center. Gills: Attached to the stem; close or nearly distant; creamy, becoming yellow with maturity. Stem: 2.5-7 cm long; .5-1.5 cm thick; white at first, but eventually discoloring dull yellow over the entire surface; dry, but with a water-soaked appearance; fairly smooth; hollowing. Flesh: Thin; white, becoming dull yellow. Chemical Reactions: KOH on cap surface yellowish to orangish; iron salts on stem surface negative to pinkish. 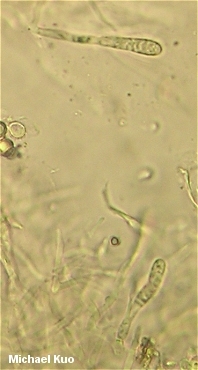 Microscopic Features: Spores 6.5-9 x 5.5-7 µ (but reported by Roberts  as 8-11 x 7-9 µ in the Pacific Northwest); with mostly isolated warts extending .5-1.2 µ high; connectors scattered, not usually creating reticulated areas--but occasionally forming broken reticula. Pileipellis a cutis embedded in a gelatinous matrix; pileocystidia abundant, subclavate to clavate, to about 150 x 10 µ, with 1-4 septa, ochraceous-refractive in KOH and positive in sulphovanillin; mature specimens with areas of golden yellow hyphal ends and pileocystidia. REFERENCES: Fries, 1838. (Saccardo, 1887; Burlingham, 1915; Beardslee, 1918; Kauffman, 1918; Kibby & Fatto, 1990; Phillips, 1991/2005; Thiers, 1997b; Roberts, 2008.) Herb. Kuo 05160402.